Pregnant with my first baby, I was so excited to find out the gender and go on a wee shopping spree – straight after the scan at 20 weeks, finding out I was having a boy, off I ran to the shops to stock up. Only to come home really upset after finding nothing really of note on offer for boys – there was so much pink, pink, pink and tulle, I actually found it hard to even locate the boys clothing. You’d find one token rack of same old t-shirts and shorts, or pants and jerseys – all printed with things like trucks and puppy dogs. I was like, huh? I’m not a truck driver, why would I want pictures of trucks on my kids clothing! So I went home with some plain tee shirts and onesies, and I hand painted my own designs on them. Once Jem was born I would get asked so often where I got his clothes from, I would have people stopping me on the street asking where they could buy a tee shirt like his, and from there an accidental business began just through word of mouth! 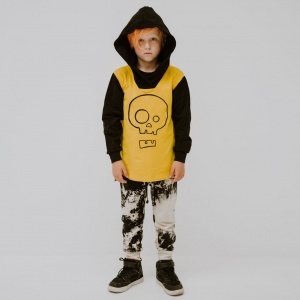 One day I posted up a picture of Jem wearing a black skull tee shirt, and orders just started streaming through – I wasn’t even trying to sell anything! 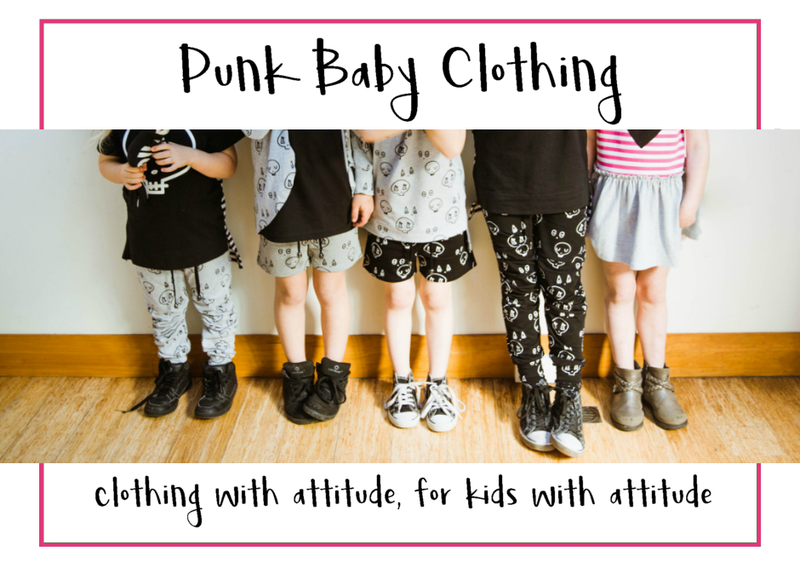 I taught myself to sew and was soon making all sorts of clothing and I have remained behind the sewing machine making all the Punk Baby goodies for a good 8 years or so. As the business continues to grow in popularity I’ve found it increasingly hard to keep up with demand, especially when its just me making everything – and instead of being able to focus on marketing and growing the business, I’ve just been stuck behind the sewing machine, going flat tack trying to keep up with orders. So this season we’ve worked with an awesome small family run factory in China to bring you the first ever complete ready to sell collection – no more waiting for those items to be made, they are all in stock and ready to go! I am stoked with the quality of the garments and care my team has taken to bring to life my vision and ideas and to step into a new era of Punk Baby Clothing! 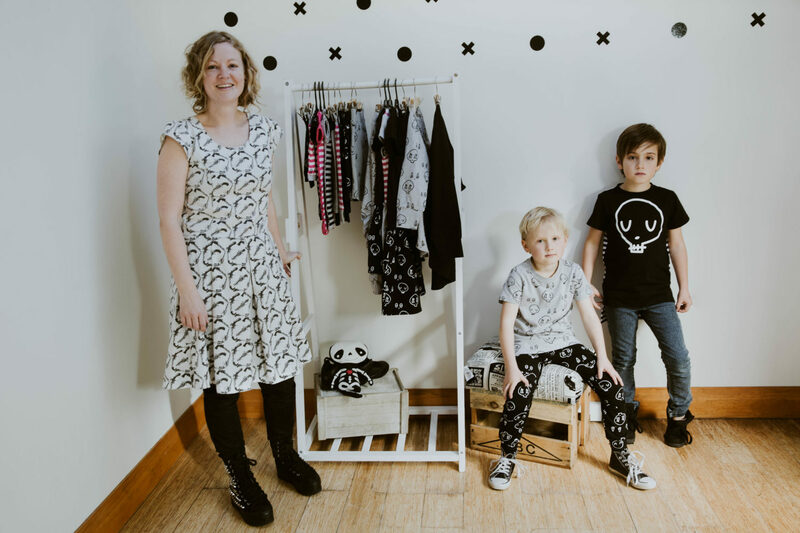 We’ve stayed true to our mantra ‘clothing with attitude’ – featuring an awesome range of skull prints from Nadia Flower Design – monochrome with a pop of pink – because pink is OK when its punk! Such as – the option to buy new releases first, and early access to sales! Fantastic! Can’t wait to see it! Love it and I remember feeling exactly the same and also crying when I was pregnant with my 12yo because I couldn’t find him a jacket that wasn’t navy/plain or military style!